I never dreamed 18 years ago that I would be building picture frames all these years later, yet here I am. Prior to meeting Wendi Miller and learning the trade I was a professional musician and recording artist. Initially I thought I’d work with her and move on to something else. We are as different as we are alike. She is a Carnegie Mellon University alumni who has pursued her own happiness in a variety of unusual ways, scuba/cave diving, motorcycling and competitive firearms. Wendi is a life long resident of Pittsburgh and has been in business for 40 years. Along with her myriad interest she has managed to raise a son who has moved to NYC and is perusing a career in film making, after his graduation from Pratt. I am also the proud parent of a daughter who graduated from Kent State University in Ohio and got a master’s in forensic science from George Washington University in Washington DC. She then went to work for the National Counter Terrorism Center. Wendi and I, being children of the 60s are both steeped in the political activism of the era. And spend a great deal of time at work discussing political and social events in the world today. Suffice to say we have not abandoned our 60s cred and remain committed to liberal causes. How we come to involve ourselves in the work we have donated to the Thomas Paine Cottage is the result of, as Paine put it, “endeavoring to make our fellow creatures happy.” Along with music I am a voracious reader. I have my union organizer father to thank for setting me on the path to enlightenment. I grew up on Upton Sinclair, Clarence Darrow, Saul Alinsky, Edward Bellamy and of course Thomas Paine. Along with Paine’s writings his life story has always intrigued me and I had resolved years ago to make a pilgrimage to New Rochelle and stand in the place where he had spent the last year’s of his remarkable life. Sounds logical! We’re picture framers and huge fans of Thomas Paine. We explained this to John and offered to donate our services. Before we left that day we measured the deed to the Paine farm, which was on display simply mounted on a mat board, covered with mylar and rested on an easel. This deed was given to Paine by the state of New York for his service to the revolution. As soon as we returned to Pittsburgh we built a beautiful burrell wood frame with a gold liner and shipped it off to John in New Rochelle. Wendi chose this for its 18th century look. A few weeks later George Washington arrived at the shop. Before we could put George into an appropriate frame he had to go visit a dear friend of ours who is one of the preeminent art restorers in the country. He is a great artist in his own right. The man, Carroll Westfall, who is in his 90s is a highly decorated WWII veteran. His bravery in battle earned him a Bronze Star, two Silver Stars and several combat infantry medals. He put his life on the line as did thousands of Americans to preserve the Republic that our founding fathers left for us. 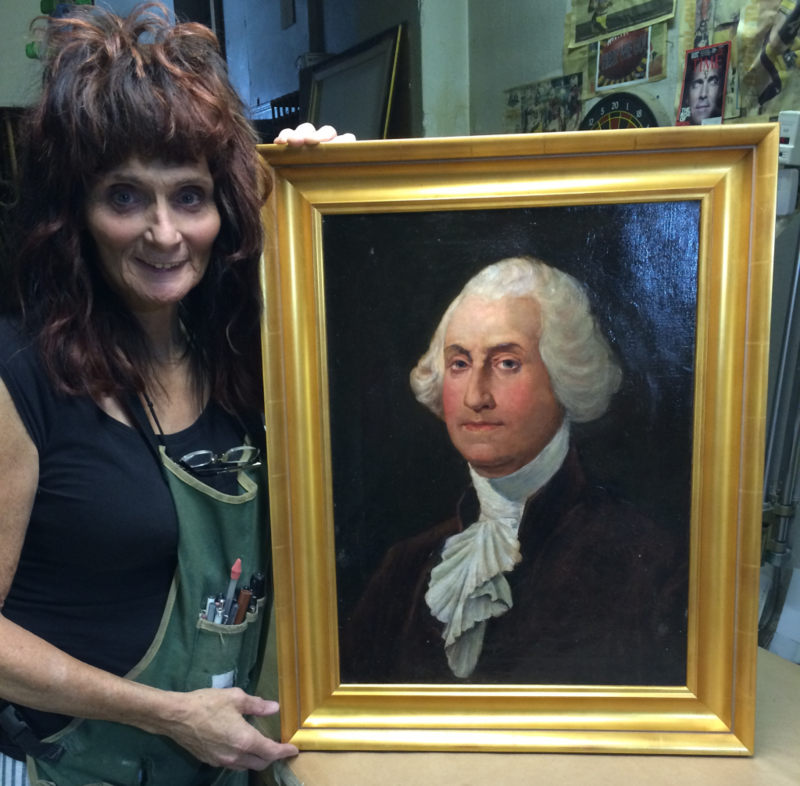 In Carroll’s capable hands George Washington was relined, cleaned and restored. He even found the artists signature buried under all the dirt and oxidized varnish. When George came back to the frame shop I was astonished. I knew Carroll was good, but I think he hit it out of the park. So Wendi and I got busy re-stretching and building the beautiful frame that is George’s new home. As the song says, “what a long strange trip its been”. I consider it a privilege to have been able to do something like this for a very worthy cause. As a society we need to preserve the artifacts of our collective past, lest we forget from whence we came and loose our way forward. Thomas Paine gave of himself in writing the blueprint for the American revolution and gave the proceeds from the work of his pen to Washington’s army and in doing so impoverished himself. I have read every word he wrote and am in awe of his contribution to our country and to humanity. I think I speak for the three of us in saying that in a small way we have said Thanks Tom!